UltraCem® - Products - Procedure - Ultradent Products, Inc.
UltraCem resin-reinforced glass ionomer cement offers the best of both worlds in a luting material: efficient delivery and unsurpassed performance. It is the world’s first liquid-powder RRGI cement that can be mixed and delivered through a syringe. Its advanced chemistry boasts the highest bond strengths in its category, while its unique SpeedMix™ syringe ensures the ultimate luting convenience. UltraCem cement is also available in a traditional hand-mix bottle kit, an economical choice that gives clinicians control over amount of material used. 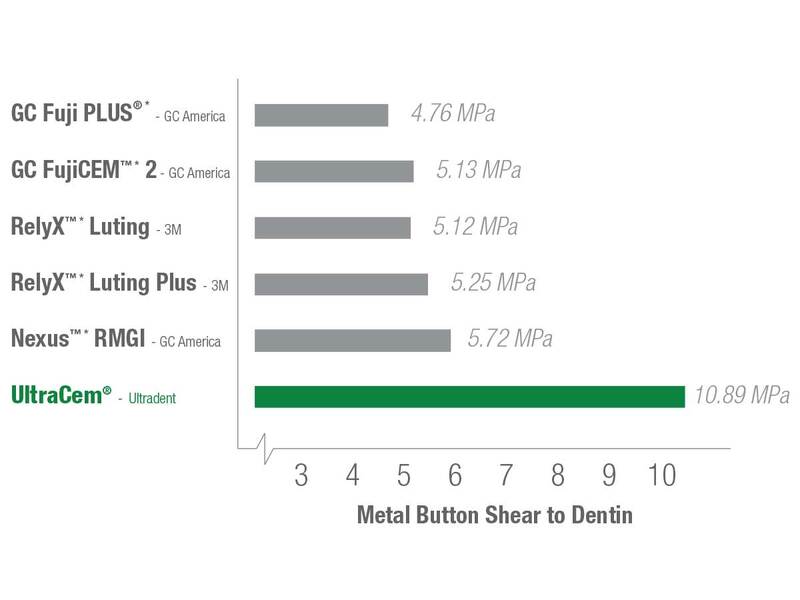 UltraCem is indicated for cementation of indirect restorations (including inlays, onlays, crowns, and bridges) made of metal, porcelain fused to metal, zirconia, and resin to natural teeth. This product is also intended for cementation of orthodontic bands to natural teeth. ​The SpeedMix syringe makes luting easy and convenient. ​Mixing has historically been the downside of liquid-powder RRGI cements, requiring additional appliances and time-consuming trituration. Now, the SpeedMix syringe effectively mixes and delivers a superior liquid-powder formula—in seconds and with no mess. It's faster than hand mixing, and gives you consistent mixing ratios every time. The unit-dose delivery ensures a low risk of contamination. 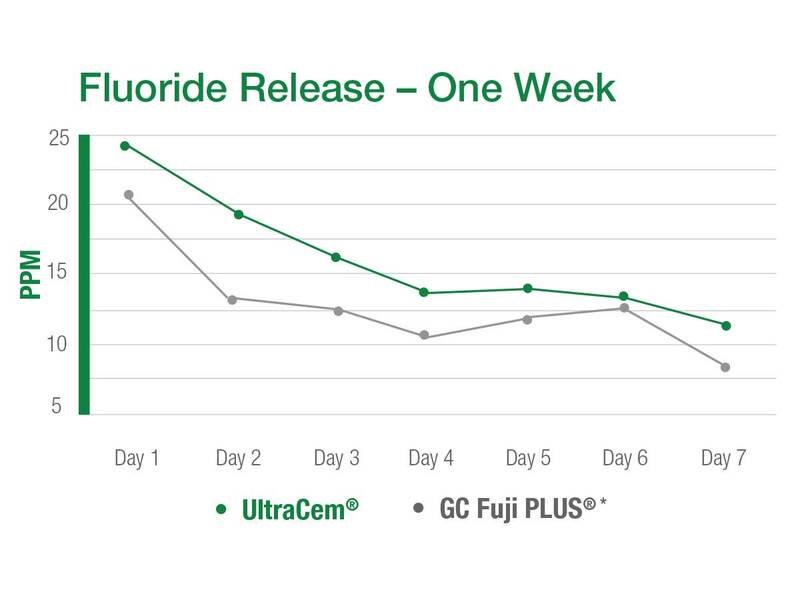 ​The fluoride-releasing chemistry of UltraCem RRGI cement helps to minimize post-op sensitivity and provides caries-prone patients additional protection against decay. ​For clinicians who want more control over the viscosity of the cement and the amount of material used, UltraCem RRGI cement can also be purchased in a traditional hand-mix bottle kit. ​Flick or tap barrel four times to fluff powder. ​Press white stem completely into green stem in order to push liquid into powder chamber. ​Leave metal rod in place; grasp plastic delivery/mixing tip and mix chemical 10 to 15 times vigorously back and forth. ​Remove metal rod and discard. ​Remove yellow clip and discard. “UltraCem is piece of cake to use. The white tip is pressed into the green plunger and then the entire tip is cycled in and out for about 15 times. Then the yellow clip is removed and the cement is ready for delivery. The powder liquid mixes very easily and quickly and doesn't spray around. Clean up is a breeze. This is a terrific material and is now my #1 glass ionomer cement in the office." Can I use UltraCem for zirconia restorations? ​Yes. Apply Peak® Universal Bond to the preparation using a scrubbing motion for 10 seconds. (No etchant is required.) Aggressively air thin until the surface appears dull and light cure for 10 seconds with VALO® LED curing light. For best results, sandblast the inside of the zirconia prosthesis; clean with air/water spray, and dry. Can I use a zirconia primer with UltraCem? ​Never use phosphoric acid to clean zirconia, as it will significantly reduce bond strengths. Do not use a zirconia primer with UltraCem. What is the working time and set time of UltraCem? ​Working time is between 1-3 minutes. At about 3 minutes, UltraCem will start to cure and become more gel-like. This is the stage where removal of excess cement around the prep is the easiest. UltraCem will be fully set in the mouth in 5 minutes. Note: UltraCem will set up less quickly on a mixing pad than in the mouth. How does UltraCem achieve such high bond strengths compared to other RRGI Cements on the market? ​UltraCem’s formula contains polyacrylic acid, which is self-etching. Longer setting time is needed for it to effectively etch the tooth surface, thus yielding the higher bond strengths. How many crowns can be cemented with one SpeedMix Syringe? ​One unit-dose syringe can cement up to two crowns.